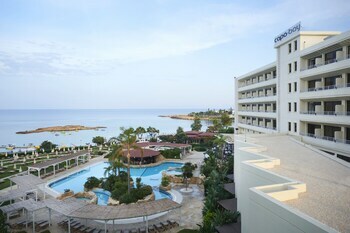 With a stay at Capo Bay Hotel in Protaras, you'll be near the bay, within a 15-minute drive of Ayia Napa Monastery and Fig Tree Bay. Featured amenities include a 24-hour business center, express check-in, and express check-out. Planning an event in Protaras? This hotel has 2561 square feet (238 square meters) of space consisting of a conference center and meeting rooms. Free self parking is available onsite. Located in Pegeia, this apartment is convenient to Pafos Zoo and Coral Bay Beach. With a stay at this villa in Paralimni, you'll be within a 15-minute drive of Ayia Napa Monastery and Protaras Ocean Aquarium. Free self parking is available onsite. With a stay at Oceanview Luxury Villa 109 in Ayia Napa, you'll be within a 10-minute drive of Ayia Napa Monastery and Cape Greco National Forest Park. Free self parking is available onsite.